*It’s a good Saturday when you can get your errands over with early, bring lunch home and then take a nap on the couch for like an hour. It’s great, especially the nap part. The nap is the best. *You know I’ve recommended coloring to my kids a lot for relaxation but I’m not always good at following my own suggestions. 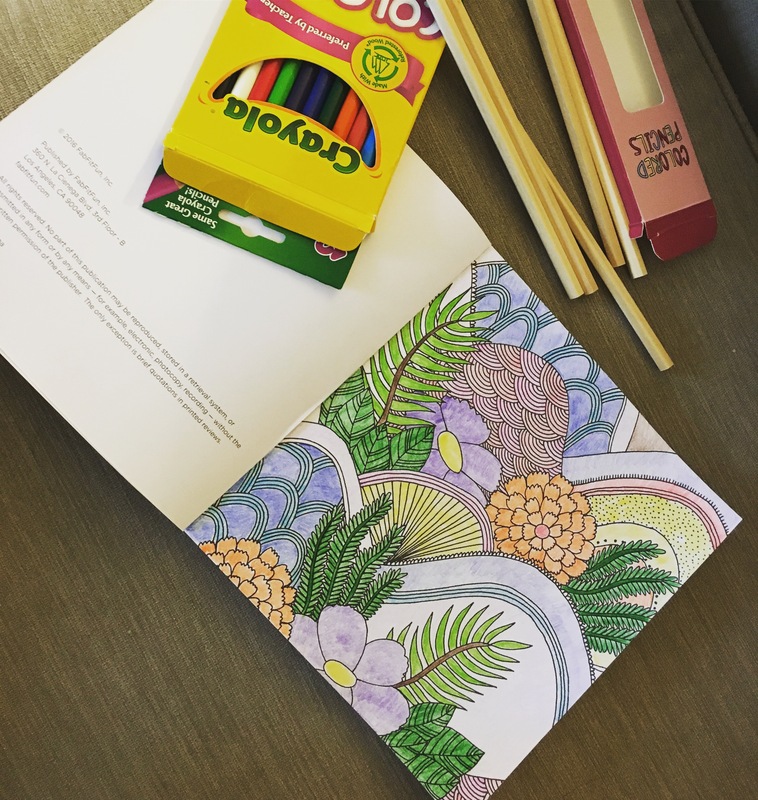 But, thanks to my FabFitFun box I have a coloring book at my disposal. And I took some time out to do a little relaxing and self-care. *I ran to Old Navy today to grab a couple of tees for some of our spirit week themes at school this week and I always forget how soft their tees are. I’m trying to be really good and not spend a lot of money right now and if I wasn’t doing that I probably would have bought more of them. But, I did get this super soft tee that I might actually need to exchange for a different size because I didnt feel like trying it on in the store, for twin day with my work bff on Tuesday. I also grabbed this really cute and soft tank for only 2 bucks! I’m not a big sleeveless girl, but it’d be great under a blazer or cardigan. They had so many sales this week and apparently are just going to keep having sales, so I’ll probably be back. *Devon bought Moana on DVD from Amazon. I’m like…”the hell did you buy Moana for?” “Well we are gonna have kids one day, Steph.” I kinda raise my eyebrow at him. And he’s like “well actually it’s for the kids once testing is over next week to keep them entertained….but the us having kids part is true, too! We can still building the kiddie DVD collection now.” Yes, darling. Whatever you say, love. He’s weird, I accept it. *It has looked like it’s going to pour here for like the past hour. I kinda wish it would and just be done and over with already. I like rain in the spring time. Plus, it’s like 75 today which makes no sense for Baltimore in March. Mother Nature has never really figured her life out here in the mid-Atlantic area. I am going to go and continue being lazy until Devon is done cooking me dinner. Hope everyone has a great rest of the weekend!